Welcome To J.W. Myers, Inc.
Jim Myers and his family arrived into the Central Valley in 1958. Jim was employed by Standard Oil Company in 1959 and just celebrated his 50 year anniversary! In 1965 Jim, along with his wife Karen, purchased the Standard Oil Distribution plant on Avenue 14, which is now Olive Ave. in Madera. The family started a commitment to customer service by growing the business from a single truck covering the lower Madera area, to a fleet of over a dozen trucks covering the greater Madera County. With plant upgrades, and the arrival of propane gas, and with the capability of the newer trucks being able to handle three times the work load as in 1965, the business has been able to keep up with the demands of the neighboring communities and service the needs of the farming industry as well as the growing population in the area. 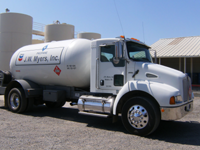 Today, Jim’s two sons, Tony and Jeff, along with a staff of longtime loyal employees, J. W. Myers, Inc. is highly regarded by Chevron as committed to customer service representing their gasoline brands and lubricants. Our environmentally safe operating plant located near the Gateway entrance to Madera at Avenue 14 and Olive Avenue has served the Madera County area since 1918, for over 90 years in the same location! In 1990, Jim Myers partnered with John Pazin of Merced and together their company, Pazin & Myers, Inc., has been servicing the needs of the greater Merced County area with the same commitment of customer satisfaction representing the Chevron brand as well as many other major gasoline brands. To request information about our gasoline brands, propane sales, service, or lubricants, please call us toll free at (800) 300-3101, or at one of the following numbers... Madera: (559)673-3101, Coarsegold: (559)683-4418 or Chowchilla: (559)665-3242, or come by and visit with us at 546 E. Olive Ave. at Gateway, Madera. You may also mail us at P.O.Box 809, Madera 93639 or fill out our on-line request form and we will gladly contact you promptly!